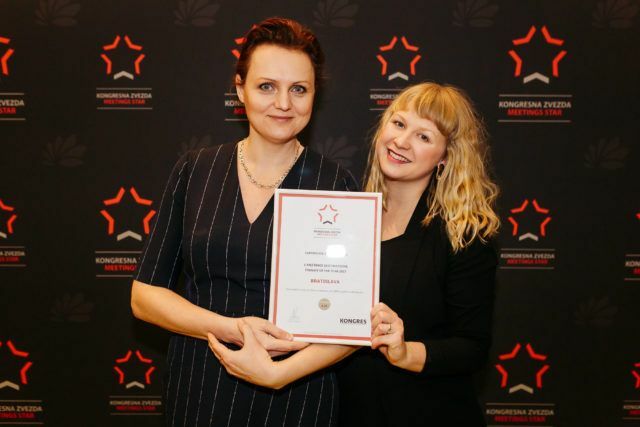 For the 10th year in the row, the Meetings Star Awards were bestowed within the Conventa trade show, held on 23rd of January 2018 in the White Hall of the Grand Hotel Union. The Best Meeting Destinations in the year 2017 were presented at the ceremony and awarded for their professionalism, development and being the shining stars of the meetings industry. The categorization of destinations is highly objective, to provide the meetings planners with as much information possible with the data on the capacities of destinations, which have been evaluating using the Meetologue methodology. All destinations have been evaluated on the basis of the field trips and research, in order to get as close as possible to the real situation. In the L Meeting Destinations, which are the ones, that can host a maximum of 2,000 congress participants, offer the suitable infrastructure and aviation connections the winner was Ljubljana, with a score of 4.33. While Ljubljana won in the L Meeting Destinations, Bratislava was one of the finalists, with the score of the 4.20. Bratislava truly is the uprising star in the MICE industry, and the New Motor City! While one might wonder, how to reach Bratislava, there are various options – traveling by air, road or rail, or choosing the liquid option of arriving via the beautiful blue Danube River. The Bratislava city airport offers numerous connections and works in conjunction with Vienna airport, which is only about 50km from Bratislava city center. The destination offers 5,094 of 4* and 5* category hotel rooms, 73 of 4* and 5* category hotels, the maximum capacity of their banquet hall can accommodate up to 600 attendees, while the largest hall in the city has 2,000 m2 and the maximum hall capacity in theatre style can accept up to 2,500 attendees. Bratislava has long lived in the shadow of neighboring Vienna and Prague but today, fresh and full of new energy invites international congress organizers.